This chapter examines the history and development of Canadian Studies in German-speaking countries, examining the role of individual scholars and disciplines in this process as well as the institutionalization of Canadian Studies within the broader framework of academia. This will be accompanied by analysis of the complementing and shifting paradigms in research and teaching that have informed Canadian Studies in Austria, Germany, and Switzerland. A major focus is on the interplay between cultural diplomacy, scholarship, and the recognition of a country that for long has been in the shadow of the United States. The latter point is particularly true for Germany which, in the decades following World War II, became strongly oriented toward the US. Canadian Studies became part of North American Studies, unless the field had already been subsumed under Commonwealth or Francophone Studies. 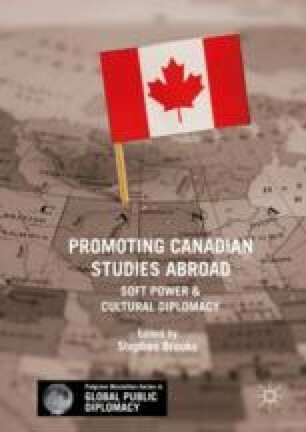 After disappointing years under Conservative government, leading to the termination of government support for Canadian studies abroad, the community of researchers and teachers engaged in Canadian studies has dwindled. The end of Canadian government funding was, however, only one of the factors leading to this decline. Nevertheless, the community of German Canadianists shows signs of remarkable resilience. I am indebted to Konrad Gross and Dirk Hoerder for their groundbreaking work on the emergence and development of Canadian Studies in the German-speaking countries (see references). All English translations of German titles are mine. International Research Training Group. “Diversity” (IRTG). www.irtg-diversity.com. Web.